Greetings from the land of milk and honey -- a place that always sounds bountiful and pleasant in story books. Well, if I can't live in such an imaginary place, I can create a reasonable facsimile, or should I say chocolate facsimile (chocsimile), of such a place. Welcome to the last, extended day (Day # 9) of Chocolate and Flower Theme Week, and the first day of Chocolate and Honey Theme Week. 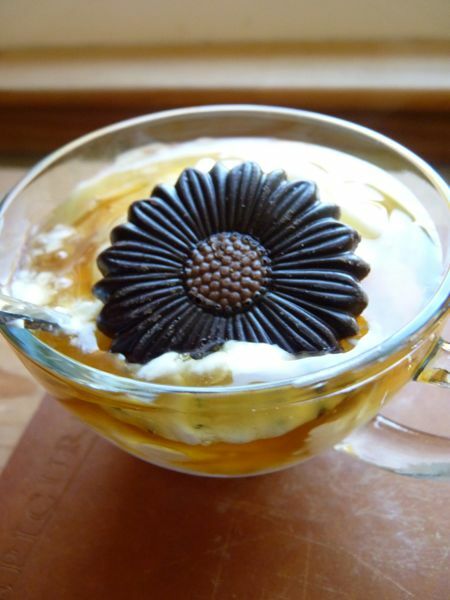 Today's combination of Fage Lowfat (2%) Yogurt with Honey -- poured over the top -- was garnished with a realistic-looking, molded, solid dark chocolate daisy from (Portland, OR based) Moonstruck Chocolatier.